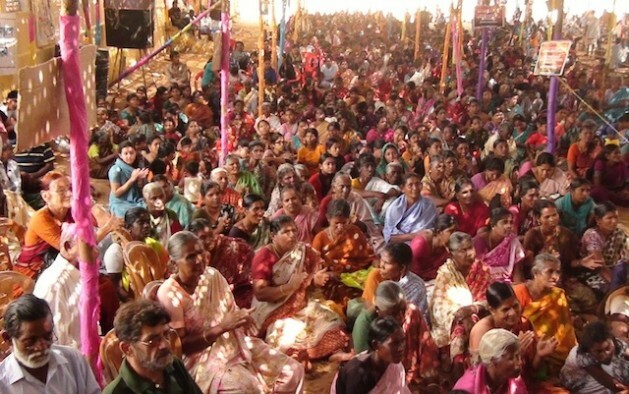 Local people protest over the Koodankulam nuclear plant in India. Credit: K.S.Harikrishnan. NEW DELHI, Jan 25 2013 (IPS) - When India was admitted to the world’s nuclear power industry nearly five years ago, many believed that this country had found a way to quickly wean itself away from dependence on coal and other fossil fuels that power its economic growth. After all, India already had a home-grown nuclear power industry that was producing about 4,000 megawatts of power from 19 nuclear reactors, defying a United States-led embargo on nuclear equipment imposed after it carried out a nuclear test in 1974. India’s refusal to sign the 189-nation Nuclear Non-Proliferation Treaty (NPT) was also a cause for its isolation. It took a special waiver in September 2008 by the Nuclear Suppliers Group (NSG) of 47 member countries to allow India to engage in nuclear commerce. With the embargos lifted, India’s planners envisaged a string of ‘nuclear parks’ built along the long peninsular coastline by foreign investors adding 40 gigawatts (Gw) of additional power by 2020. What the planners overlooked was stiff opposition from farmers and fishers, fearful for their traditional way of life and livelihoods, the possibility of adverse seismic events, and a challenge to the nuclear energy plans in the Supreme Court by leading intellectuals. “There was little doubt that the plan to build numerous nuclear plants all along the coast would run into problems,” says M.V. Ramana, a scientist currently appointed with the Nuclear Futures Laboratory and with the Programme on Science and Global Security, both at the Princeton University in the U.S.
“Because of intensifying conflicts over natural resources, opposition to new nuclear sites will only get intensified in the future. Water scarcity, for example, is becoming more severe by the year,” Ramana told IPS in an email interview. “Fisherfolk are already seeing their livelihoods threatened by a number of developments – industrial and power plant effluents being discharged into the sea is an important one,” Ramana said. Currently there are intense protests at Jaitapur in western Maharashtra state where a 9,900 MW nuclear park is being built by the French power developer Areva SA, and also at Koodankulam in southern Tamil Nadu state where a Russian nuclear power facility is nearing completion. What should nuclear planners do to address the growing domestic opposition to nuclear energy? A bigger issue looming up is the possibility of a Fukushima-style disaster, especially at Jaitapur, a site eminent geologists say is vulnerable to seismic activity. Vinod Kumar Gaur, one of India’s leading seismologists and a distinguished professor at the prestigious Indian Institute of Astrophysics in Bangalore, says site investigations around Jaitapur were seriously flawed. According to Gaur, it is hugely significant that the Jaitapur site is only about 110 km from the Koyna dam which developed serious cracks after it was hit in 1967 by a quake that measured 6.4 on the Richter scale. It is also significant, Gaur said, that in the year 1524 a major tsunami had hit the western coast 100 km north of Jaitapur. The possibility of a tsunami caused by offshore faulting or a distant earthquake was not discussed in existing studies. Gaur told IPS that “confirmation or refutation through scientific investigations is critical to determining the seismic safety factor for the Jaitapur plant, and the recent earthquake in Japan has demonstrated that it is relevant to plan for all possibilities when it comes to designing nuclear power plants. Ramana said it was time that India’s secretive Department of Atomic Energy (DAE) engaged in an honest and open debate over its nuclear plans with the country at large, in particular the people who live in the vicinity of proposed sites. “DAE has to let go of scientifically indefensible positions like its claims that its reactors are ‘100 percent’ safe and that the probability of a nuclear accident is one in infinity, i.e., zero. There is always a non-zero, albeit small, possibility of a nuclear accident occurring at any reactor,” Ramana said. The DAE has avoided holding public consultation called by the People’s Movement Against Nuclear Energy (PMANE) that is leading the resistance in Koodankulam. “Given that civil society has repeatedly called for public debate, the prime minister should step in and hold consultations across the country on the relevance and role of a dangerous and expensive energy option,” said Karuna Raina, campaigner against nuclear energy for Greenpeace in India. The biggest challenge yet to India’s ambitious nuclear plans is a writ petition filed in India’s Supreme Court in October 2011 by eminent citizens asking for the court’s intervention to stay all nuclear construction until safety reviews and cost-benefit analyses are carried out. In its appeal to the court the group said the nuclear programme goes against the “fundamental right to life” guaranteed by India’s constitution.